The son of two of our all-time favorite individuals, "Kubota" was a singleton puppy who proved time and again that a quality "litter" certainly doesn't mean big numbers! A stallion type of dog, he sat home for many months waiting to mature before competing in earnest. He finished easily with Specialty wins, Best of Breeds and a group placement from the classes as well as a spot in the Top Ten. 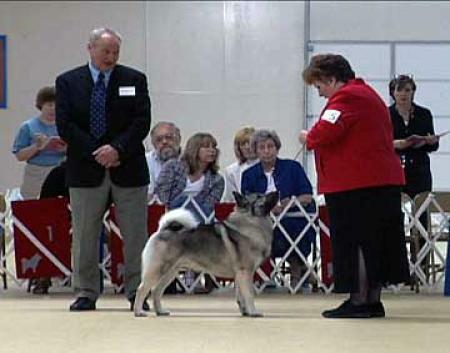 Overall, he has SBIS wins at the Norwegian Elkhound Club of the Potomac Valley under breeder Rose Martino ("Fromar") as well as the Greater Milwaukee Norwegian Elkhound Association under Edna Martin. His Utstilling Best in Show was at the Garden State Norwegian Elkhound Club under judge Barbara Innes from Canada ("Karin") who gave him a wonderful critique. He was a multiple Hound Group winner, too! Kubota had the unique ability to pass on some of the very best traits of his heritage as evidenced by his many Champions, multiple Best in Show winners, group winners and placers.. most of which have done very well at Specialties under breeders from around the world.